Here is the story of the once-unloved and abused 3-drawer chest that now lives in my entryway. When I first met this chest, it only took $5 to bring it home. As you can see, it wasn't worth much more. It was nicked, marred, damaged. It was ready for a fresh start. To begin its new life, it gave up its loose Sheraton-style handles and prepare for patching and painting. 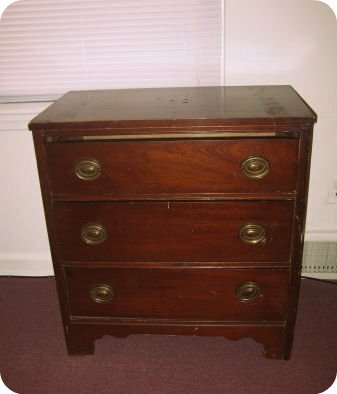 The poor little chest had been through a lot already, and now it was primed for beauty. Bring on the Martha Stewart "Wrought Iron" glossy paint and vintage brass drawer pulls from Ebay! And, just like that, this little guy had a new lease on life, greeting anyone who comes to my apartment. Now, doesn't the chest look so much better? My friend David, who now lives on the chest, approves the transformation. As does my whole living room. The color is great and I like those pulls! Looks awesome. Those knobs are perfect. I love the color you chose and it's just the perfect size for your entry and end table duty. Good job! Love it Ashley. I love seeing how your home is evolving. You're a true example of patience pays off and finding things you love to create that collected/evolved look! What a difference! The chest looks beautiful! Looks fantastic. Very chic. Love the high gloss. Oh and I agree with Fran. It is so refreshing to see your vision come alive. Perfection! I love that you painted it blue - nothing like a fresh coat of paint to change everything. I remember when the shelves were there. The chest was a great replacement. It really warms up the space. Great job! totally worth the $5 investment, it actually looks like its worth so much more now!! !